Built in 1955, this school was named for Horace Mann (1796-1859), the U.S. Congressman and education reformer widely known as the "Father of American Education." Mann High School was first occupied on April 9, 1956. 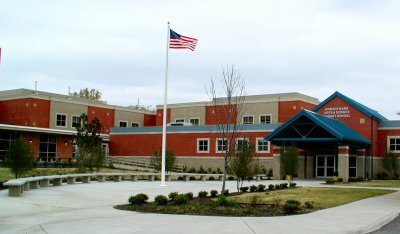 It was built as the new high school for African-American students, moving them out of Dunbar Junior-Senior High School, which then became solely a junior high school. Mann had 37 classrooms, a gymnasium and a cafeteria, and the cost of construction was about $926,000. Mann was recognized for its design by the American Institute of Architects. Photo: The original Mann campus. Additions to the original building were made in 1963 and 1965. In 1971 it was converted to a middle school (grades 8 and 9); it became a junior high in 1978 with the addition of the 7th grade. Mann became a science magnet school in 1983 (the arts magnet strand was added in 1987) and now offers magnet programs in the sciences and visual and performing arts specialty areas. Science students at all levels take a full-year laboratory science class in addition to all required core curriculum courses. Each student is required to complete a research project each year, including a display at the annual science fair in February. Arts magnet students take courses appropriate to their selected area of concentration: visual arts, drama, dance or music (band, orchestra, piano or voice). In 2001 a major portion of the school was demolished due to structural instability, and a modern new replacement building opened in January 2004. 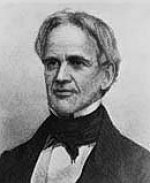 Horace Mann was born in Franklin, Massachusetts, in 1796. He had little formal schooling but read extensively at the Franklin Town Library where he learned enough to be admitted to Brown University in 1816. He went on to study at Litchfield Law School and received admission to the bar in 1823. In 1827 Mann won a seat in the state legislature, and in 1833 he was elected to the State Senate. Of the many causes dear to Mann's heart, none was closer than the education of the people. In 1837 Mann accepted the newly founded post of Secretary of Education. During his years in this post, Mann published twelve annual reports on the integral relationship between education, freedom and Republican government. He wanted schools that would be available and equal for all--part of the birthright of every American child, rich or poor. He believed that poverty would disappear as a broadened popular intelligence tapped new treasures of natural and material wealth. He felt that there was no end to the social good that might be derived from a common (public) school. As Secretary of the Board of Education, Mann presided over the establishment of the first public normal school in the United States at Lexington in 1839. Fifty high schools were built, and a six-month minimum school year was established. Mann led the movement to set up teacher institutions throughout the state. In 1848 he resigned as Secretary of Education and went on to the U.S. House of Representatives. He then took the post of President of Antioch College in 1852. He stayed at the college until his death on August 27, 1859. Two months before his death he addressed the graduating class: "Be ashamed to die until you have won some victory for Humanity."